Cheese and cocktails go very well together. The complex flavors in cheese contrast nicely with cocktails, which can be sweet, sour, thin or creamy, depending on what best suits the cheese. And the various base spirits also bring out different aspects of the cheese. A cocktail can elevate any moment to a memorable occasion. Its flavors range from refreshing, strong, sour, sweet to bitter – and with plenty of complexity in flavor. 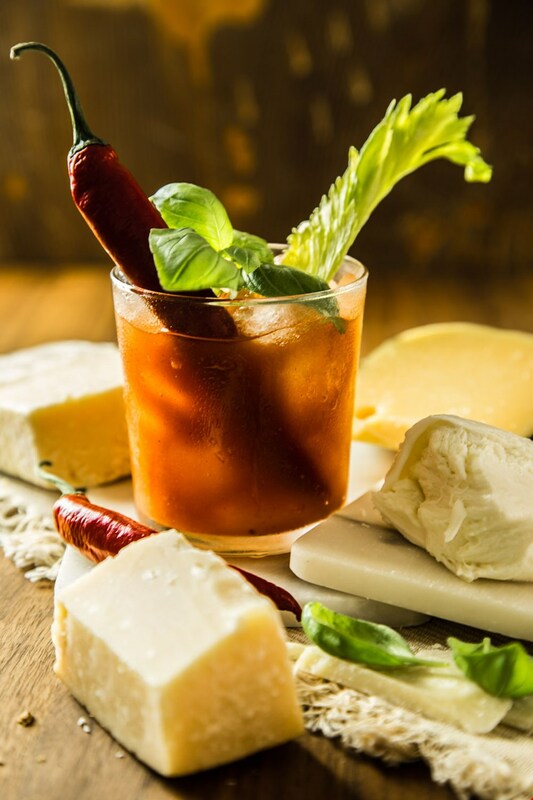 And there’s an extra bonus for cheese lovers – cocktails and cheese are a perfect match. With the wide variety of cocktails, there is a drink that can be tailored perfectly to match your cheese board. Like cheese, cocktails vary greatly, and not all cocktails suit all types of cheese. It is a good idea to test different cheeses with the cocktails you want to serve ahead of time to ensure the best pairing. The most important element of any cocktail is the spirit that forms its base. Whether a cocktail is based on vodka, gin, rum or whisky, each influence the taste of the cocktail in their own way, just like they each influence the taste of the cheese. Gin is distilled with herbs and berries, and a good gin has a fresh taste with many herbal and floral notes. It's these floral notes that go so well with cheese – from mild white mold cheese to stronger cheese, like a lightly smoked cheese, an aged gouda or even a blue cheese. Goat’s milk cheeses also pair well with gin. Rum is sweet and distilled with sugar, so rum (and good tequila, too) pairs well with sweeter cheeses – as well as with cheeses that are typically served with sweet condiments. This includes hard, aged cheeses, like Gouda, Havarti cheeses and even blue cheese. Whisky and cognac also tend to have sweet and burned notes, which are perfectly suited to flavorful and slightly sweet cheeses. However, mild cheeses also pair nicely with both whisky and cognac. 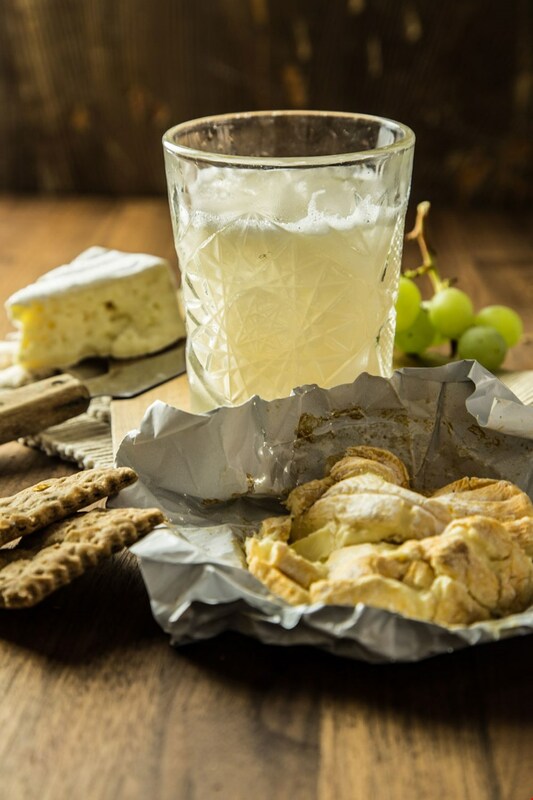 Vodka doesn’t typically have much flavor, and so it is often whatever the vodka is mixed with that determines the type of cheese to pair with it. The consistency of your cocktail also has a strong influence on how the cheese is experienced, as cheeses vary greatly in consistency. Some are soft and creamy, others hard and crystallized, and some practically crumble in your mouth. The world of cocktails is as diverse as the world of cheese - there are thousands of combinations just waiting to be tested. This British-Indian classic comes in countless variations, with different types of gin and tonic used. 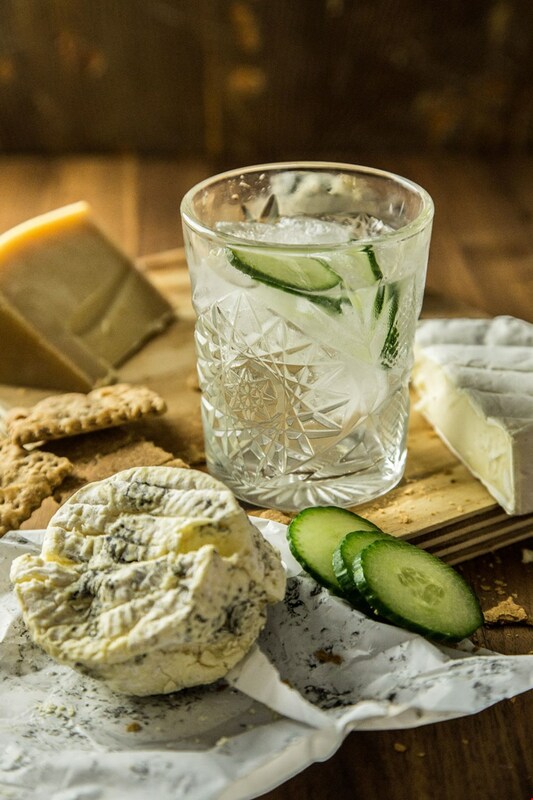 A G&T generally pairs well with soft and creamy cheeses, like brie and Double Crème cheeses, where the gin brings out the floral notes in the cheeses and the bitterness of the tonic rinses the palate. However, blue cheeses also take on lovely floral notes when paired with a G&T. A gin version of the classic sour, where lemon juice adds acidity and egg whites add froth to the cocktail, making it perfect for serving with both a mild Double Crème and Aged Gouda. The caramelized notes in gouda, in particular, contrast nicely with the acidity and floral taste of the gin. Strong and sweet with an old-fashioned flair, it combines aged notes from bourbon with orange notes from orange rind and Angostura bitters. 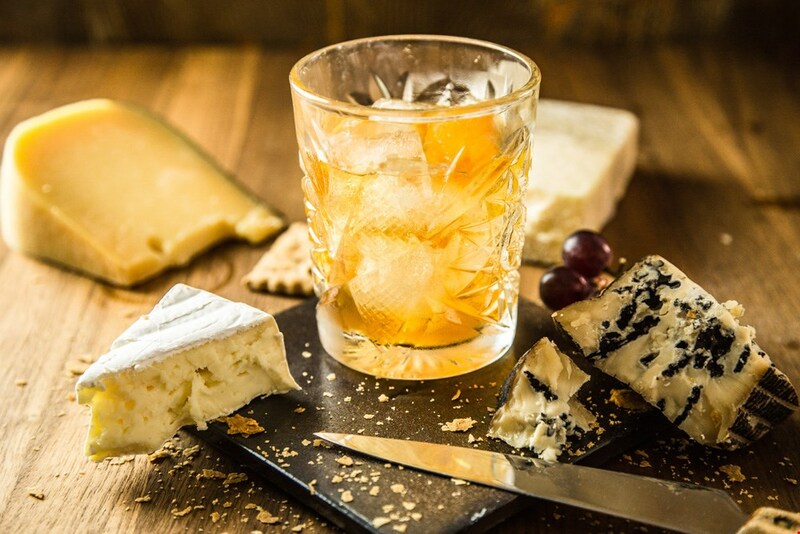 An Old Fashioned actually makes an excellent accompaniment to a wide range of cheeses, where its sweetness and caramel notes go well with everything from mild white mold cheeses to firm, aged cheeses to blue cheese. Another sweet bourbon cocktail with a bitter kick, this time from Vermouth. 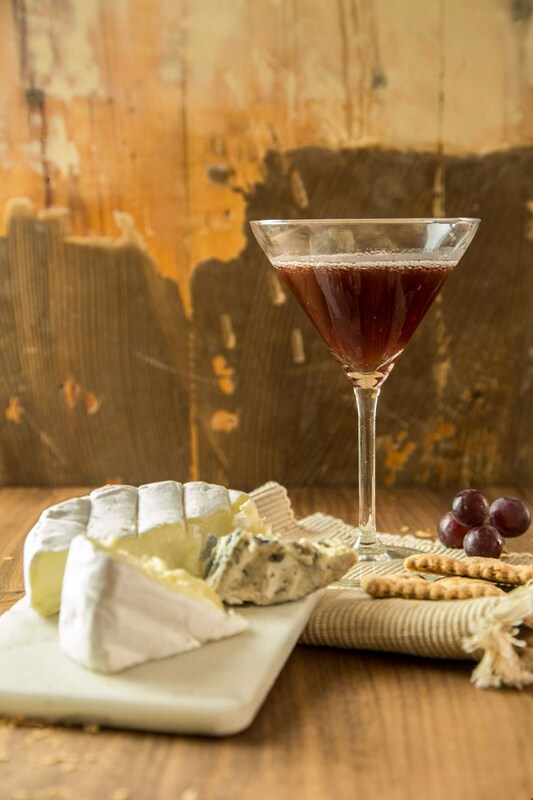 Like an Old Fashioned, a Manhattan is also a perfect match for a wide array of cheeses. It makes particularly good company for the somewhat sweeter, mature cheeses. But it also goes well with blue cheeses, as the sharp taste of the mold becomes somewhat muted, which suits some people’s tastes.